I received an update to this email. Anthropologie will be holding a charity event at their Rockefeller Center store on Tuesday, November 18th to benefit Girls Learn International. 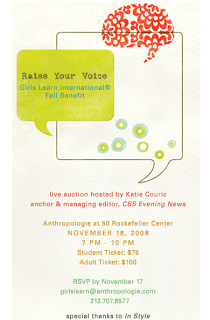 The update is that Katie Couric will be hosting the live auction! You have until Monday, November 17th to RSVP for this event. To view a larger version of the email, please click here.